Atze's Corner is a dream come true after six generations of viticulture. They brought together exceptional terroir, ancient vineyards and all the passion to produce the most exceptional wines. 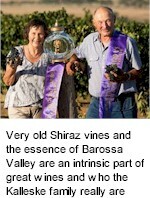 Their ancestors moved to Australia from eastern Prussia before settling in Barossa Valley circa 1843. They were skilled farmers who brought hope, years of expertise growing grapes and winemaking knowledge. Conditions were extremely tough but their passion prevailed. If you look around, you can still see some of their original plantings carved into the gorgeous Barossa landscape. It's not a coincidence that these old vineyards produce some of the most glorious wines to this day. Their outstanding quality together with a hand crafted process makes Kalleske wines unbeatable. Along with his parents John and Barb, the Kalleske are the proud owners and caretakers of many original vineyards, the oldest dating back to 1912. Behind the label, Andy Kalleske decided to take this family passion to the next level. In 2005, he started Atze's Corner and his own brand of wine production. You're able to find Barossa sub-regions separated by different terroirs. Each wine grape is unique and each terroir has its own varietal expression. Unique terroirs are responsible for how a wine will be shaped when it comes to taste, colour and smell. This is the recipe that turned the Atze's Corner label into a great symbol of quality and taste. These old vineyards, planted by their early ancestors, were the first spark that brought Kalleske wines to life. Deep red earth, great old vineyards and generations of passionate winemaking. 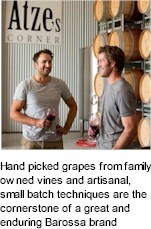 Atze's Corner is an artisan winery that uses amazing vineyards to produce its wines. Hand picked grapes from family owned vines around the Barossa Valley are the cornerstone of a great Barossa brand. Amongst the most iconic bottlings are the Shiraz vines planted in 1912 and 1951, owned by Barb and John Kalleske, Andy's parents. Other key vineyards they own are located at Koonunga and Ebenezer, eminent subregions of the Barossa, renowned for stellar Shiraz and Cabernet Sauvignon wines. Andy Kalleske was born in a family of vignerons. He's the sixth generation involved with grape growing and winemaking, always within the iconic Barossa Valley. He grew up among wine grapes and wine glasses, knowing by heart, how to nurture the fragile old vines with passion and care. After generations of distinguished Barossa winemaking, you can find exclusive, award winning red wines, refreshing white and rosé styles under the Atze label.